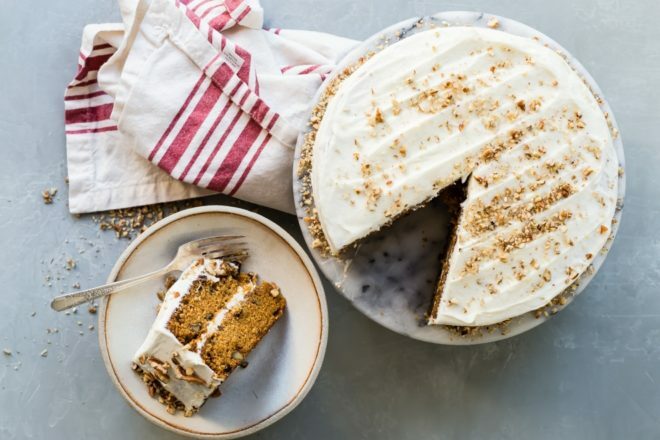 Carrot cake lovers, rejoice! This is the carrot cake of your dreams, complete with a swoon-worthy cream cheese frosting. Make a towering layer cake, a batch of cupcakes for a bunch of little rabbits, or a bundt cake for your next book club! 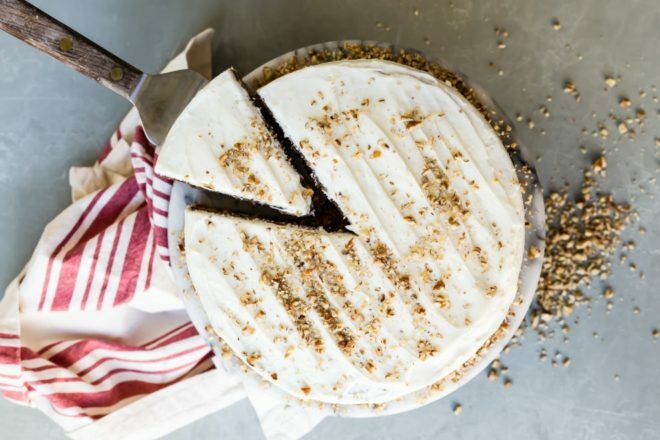 Need a different size of this carrot cake? Click and slide the number next to ‘servings’ on the recipe card below to match how many you’re feeding—the recipe does the math for you and adjusts the ingredients automatically— it’s that easy. 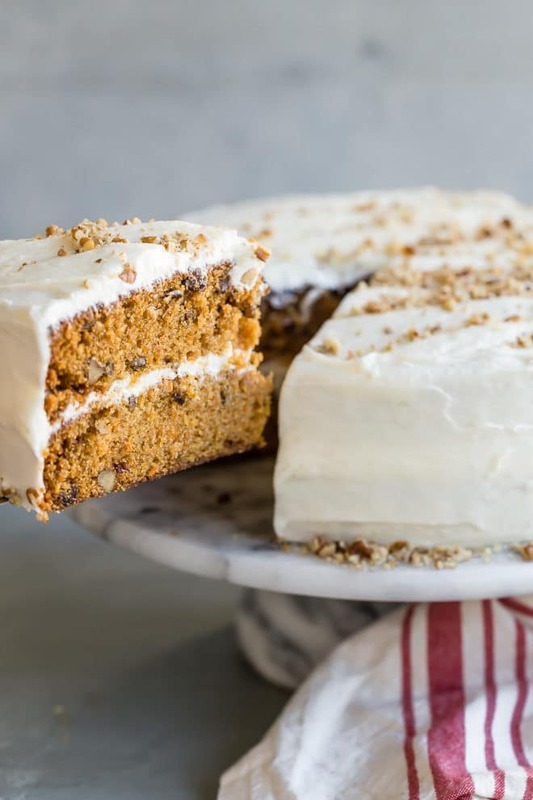 Carrot cake is a really forgiving dessert, which means that you can get pretty creative with ingredients, substitutions, or additions. It’s also a cake that you can make without a mixer. Simply mix the dry ingredients together in one bowl, and the wet ingredients together in the next. Then add the dry mixture to the wet in stages and pour into the prepared pans to bake. Allow to cool completely and you’re ready to frost! 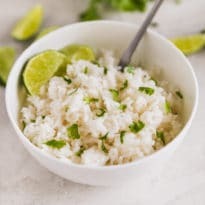 Some cooks like to substitute smooth unsweetened applesauce or some other fruit purée (like pear or pineapple) for the oil in this recipe, which works but may affect the texture of the finished product. Whole wheat flour may also be used in place of all-purpose white. And some cooks like to decrease the amount of sugar, too, and add a few more grated carrots for natural sweetness. You can use your favorite plain gluten free flour blend. This one’s easy! Just leave them out. 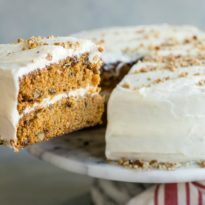 What can I add to carrot cake? This is where your creativity can flourish! Add more raisins, extra carrots, zante currants, orange zest, cranberries, ginger, nutmeg, or even shredded coconut. You can even add chopped pineapple to the cake, but have you tried Hummingbird cake, yet? Oh, you should! 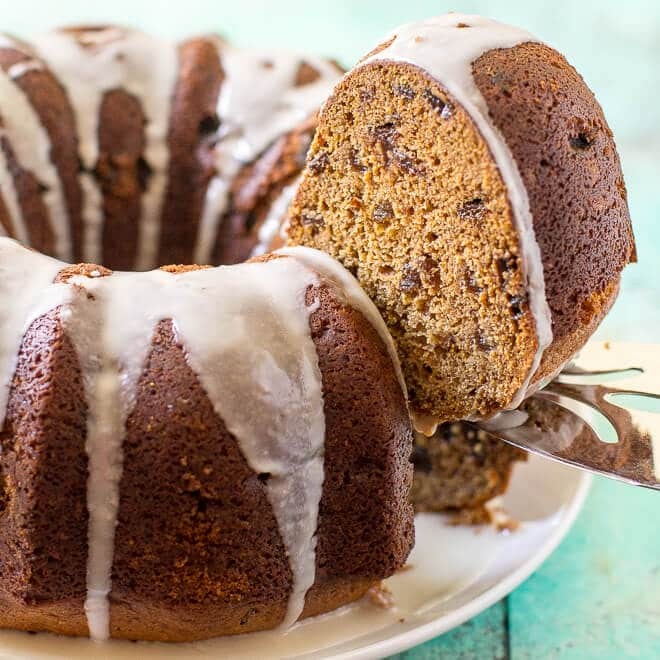 What kind of oil can be used in carrot cake? 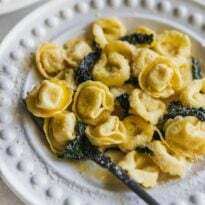 You can use canola oil, vegetable oil, grapeseed oil, or even a very light olive oil for this recipe. You can also use melted butter in place of oil, in the same proportions. To make brown sugar you need one cup of white sugar and one tablespoon of molasses. Mix the two together — this goes faster if you use an electric mixer — until completely blended. Use what you need and store the rest. Can carrot cake be frozen? 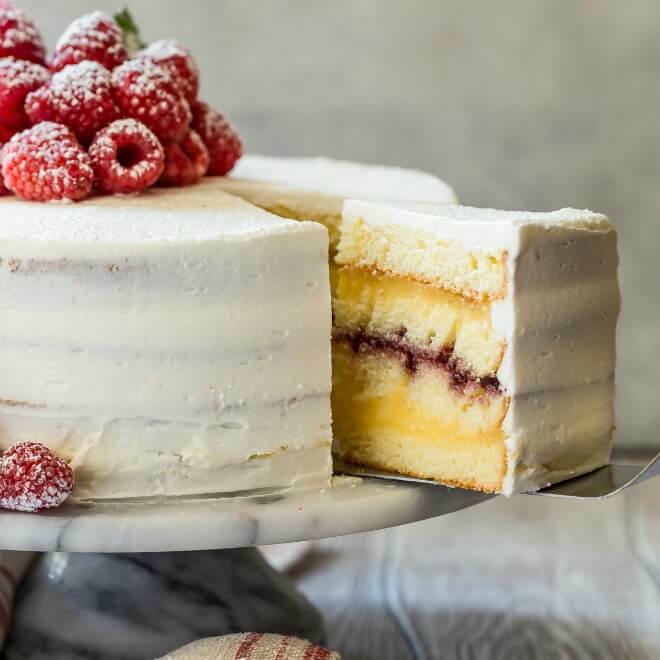 Unfrosted cakes may be wrapped tightly and frozen. Allow the cake to completely thaw before frosting. Should carrot cake be refrigerated? You should refrigerate any cake with cream cheese frosting. 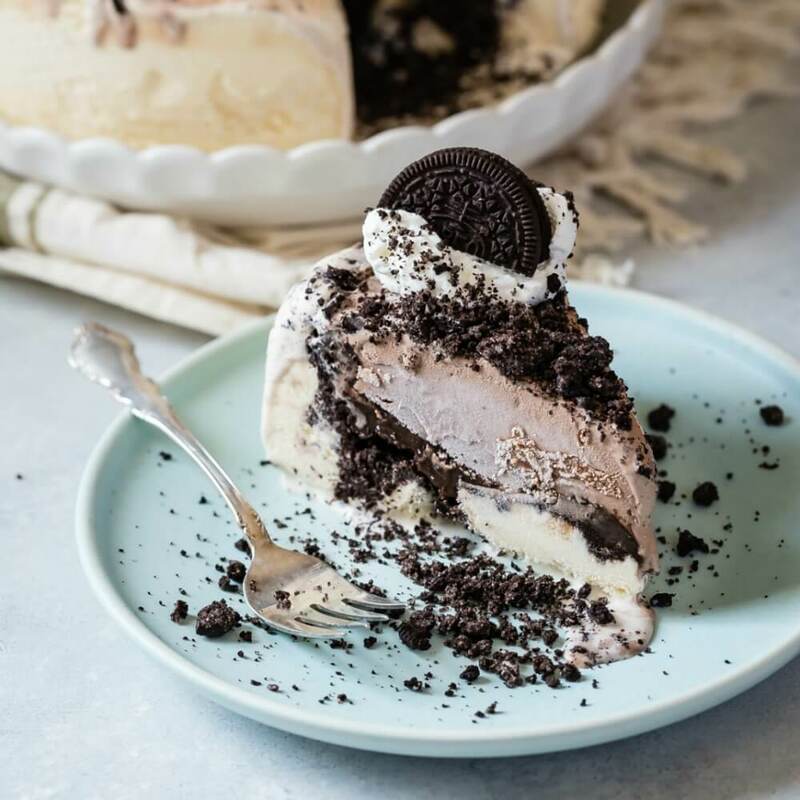 Take it out of the refrigerator an hour or two before serving so the frosting has time to warm to room temperature and the cake loses its chill. Preheat oven to 350 degrees. Coat two 9-inch round cake pans with nonstick spray, line the bottom with parchment paper, then coat the top of the paper with nonstick spray. In a medium bowl, whisk together flour, baking soda, salt, and the cinnamon until combined. In a separate bowl, whisk oil, white sugar, brown sugar, and vanilla. Whisk in eggs, one at a time, until blended. 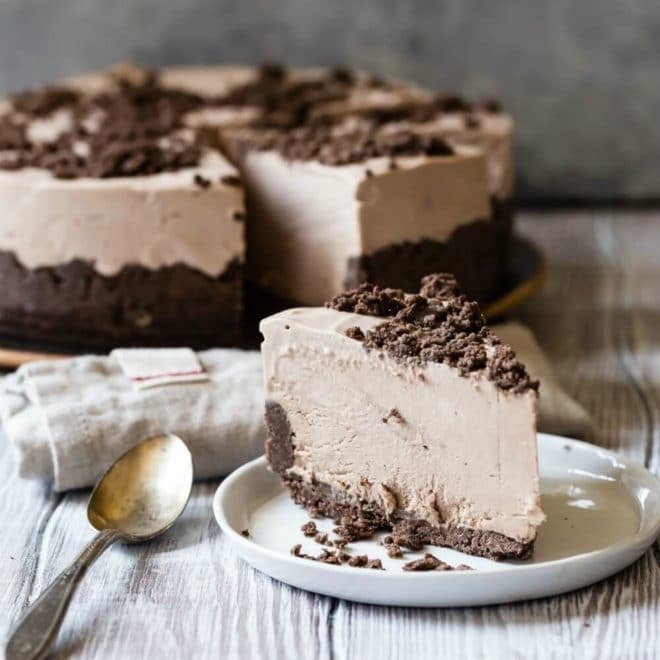 Using a rubber spatula, scrape the sides and bottom of the bowl then add the dry ingredients in 3 batches, stirring after each addition, until the batter is smooth. Stir in the carrots, nuts and raisins. Divide the batter between the prepared cake pans. Bake until the tops of the cake layers are springy when touched and when a toothpick inserted into the center of the cake comes out clean, about 35 to 45 minutes. In a standing mixer with the paddle attachment, or using an electric mixer, beat cream cheese and butter until creamy, about 1 minute. Reduce speed to low and beat in the powdered sugar, a 1/2 cup at a time, until fluffy. Beat on medium-high speed for 1 minute. Chill covered until ready to frost cake. 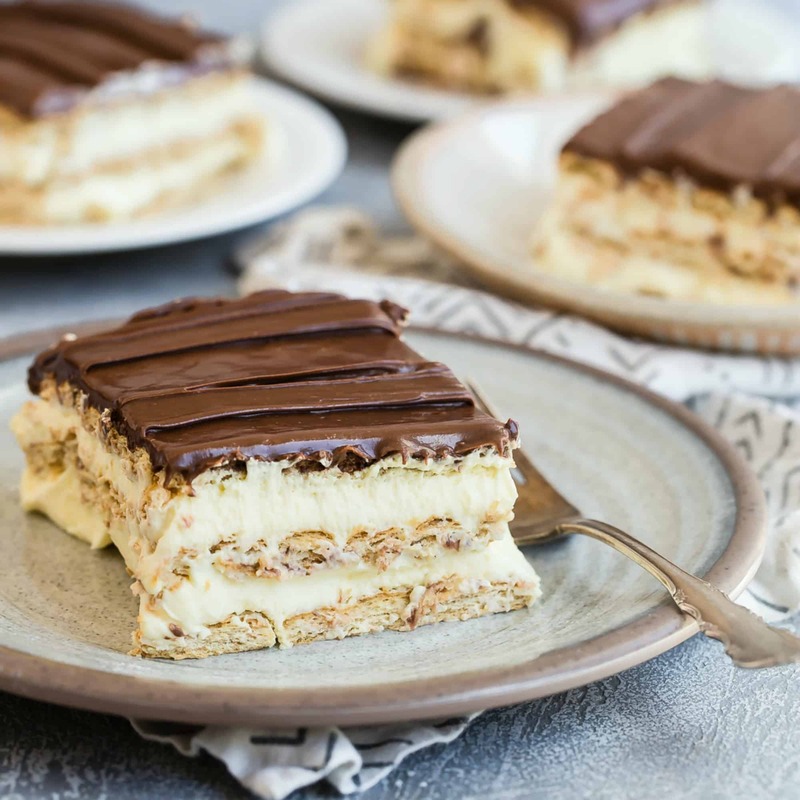 When the cake layers are completely cool, frost the top of one cake layer, place the other cake layer on top. Frost the top layer of the cake and the entire outside of the cake. Scatter nuts on top or press into the sides of the cake as desired. Preparing the Cake Pans: Even though it is a bit time consuming, don’t skimp on prepping the pans. It’s never fun to find your cake layer is stuck to the bottom of your pan. (If this does happen to you, leave the cake pan upside down and allow gravity to do its thing). How to Make Carrot Cake Cupcakes: For cupcakes, we’d recommend baking for 14 to 18 minutes (or until a tester inserted into the center of one comes out clean). Then let them cool for a few minutes in the cupcake pan before transferring them to a cooling rack. The recipe should make about 24 cupcakes. 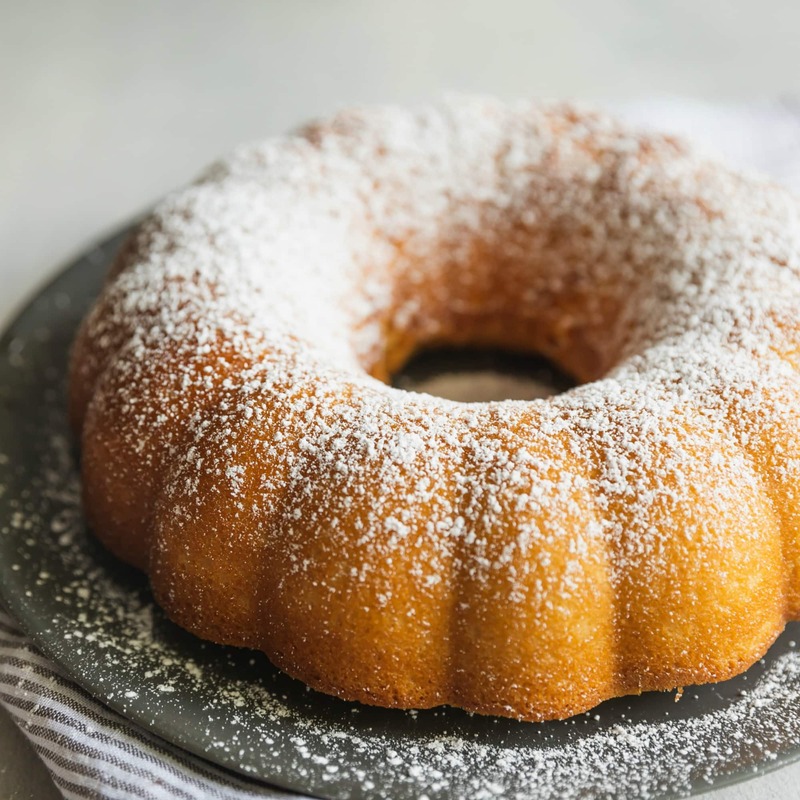 Using a bundt pan: We have never done this in our kitchen, but a 10-cup or 12-cup Bundt pan should be fine for this recipe. You will likely need to increase the baking time by about 30% in the 10-cup pan, somewhat less in the 12-cup. Using a 9-inch by 13-inch pan rectangular pan: simple! Add all the batter to the rectangular pan and bake. The bake time should be similar.